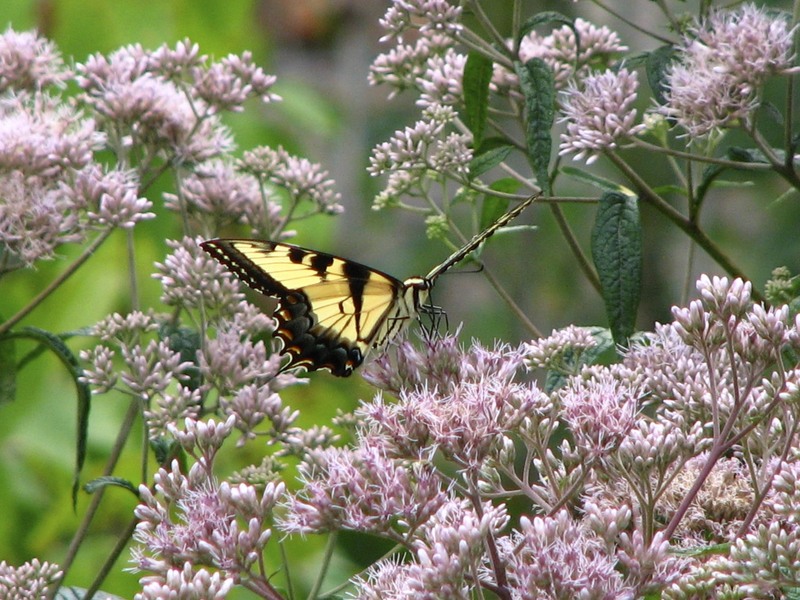 No matter where I come across Joe-Pye Weed blooming, I have seen these big yellow butterflies on top of the doomed flower clusters, sipping nectar. I bought this plant at the Bowman’s Hill Native Plant sale two years ago and it attracted Eastern Tiger Swallowtail butterflies from the first time it bloomed. A garden of good nectar sources and host plants in the local area, should provide good habitat for Eastern Swallowtails. The host plants for Eastern Tiger Swallowtails include Tuliptree (Liriodendron tulipifera), Wild Cherries (Prunus species), Ash (Fraxinus) and Sweet Bay Magnolia (Magnolia virginiana) trees. A host plant is what a butterfly caterpillar eats. Butterfly caterpillar (and other native insect larvae) are only able to eat certain plants. They are like people. We can eat some plants but others will make us sick and die. Butterfly caterpillars eat native plants almost exclusively. So, all the non-native plants we are planting in parks and gardens, aren’t helping the native insects. We are basically cutting out their food supply.